Kirgin will battle as a Viking on the women’s soccer team. Her mix of passion, skill and aggression made her a formidable opponent for most strikers and our goalie loved having her back there. Ashlyn Christine Kirgin has signed with the Missouri Valley College Soccer Scholarship, on March 26th, 2015. Kirgin has played soccer since she was six years old, beginning with SCCYSA in St. Charles County, Missouri. Kirgin played her last game for Lou Fusz Sanfilippo Girls U18 MRL, finishing her club soccer career as a defender and midfielder at the ESPN Wide World of Sports Tournament in February 2015, where her team played hard to get it to the Semifinals. "I loved having Ashlyn in defense,” said Kirgin’s club coach, Jeremy Sanfilippo. “Her mix of passion, skill and aggression made her a formidable opponent for most strikers and our goalie loved having her back there with her." 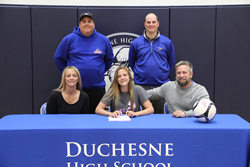 Kirgin is in her second year playing Varsity Wingback Defender with Duchesne High School Pioneers, the reigning Division 1 State Champions playing Division 2 this year and determine to go for a three-peat. Kirgin is excited to sign with Missouri Valley College and hopes to help them bring home an NAIA Championship. Kirgin will graduate from Duchesne High School with the Class of 2015.